Director Lauren Toolin and guest faculty represent decades of experience, practice and training. Lauren has spent thousands of hours with her teachers Rod Stryker, Rodney Yee and Barbara Benagh and has been teaching since the early nineties. She also helped develop and directs the worldwide ParaYoga Certification Program and has certified and mentored more than 200 yoga instructors since 2004. Faculty Meghan Hogan and Preeti Bavdekar are both program graduates and are stellar teachers in their own right. Wednesday Program: 9-3:30pm at Heartspace Troy. Most Wednesdays,. Oct 30, 2019-April 22, 2020 (graduation date is April 26th) and a few weekend days, tbd. Thursday Program: Lead by Yoga Vidya faculty, Meghan Hogan, at Lilananda Yoga. Most Thursdays. Oct 3, 2019-April 9, 2020 from 9am-3:30pm. No class 11/28, 12/26, 1/2, 2/20. 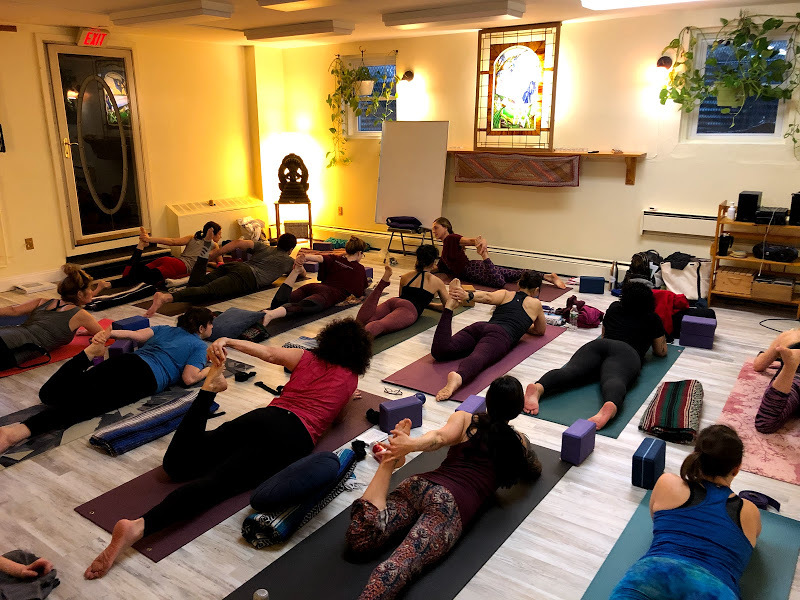 More than a workout… A foundational aspect of Yoga Vidya’s 200 hour teacher training is the understanding that Yoga is more than just a fitness program. This program is for you if you have a passion for Yoga and a strong desire to enhance your knowledge and practice. Use this training as an opportunity to build new friendships and advance your capacity as a serious teacher! Share your Yoga knowledge with the world while developing the tools for a balanced, happy and healthy life. Practice! Your individual practice is key to the wellspring of health and wisdom that is Yoga. You will be expected to practice a minimum of five days per week, for at least 20 minutes, and you will also journal as a tool to gain additional insight. Attendance at all trainings and workshops is mandatory in order to receive a certificate of completion and to graduate. Completion of all reading and writing assignments in a timely manner. Attendance in at least 15 classes with Approved Teachers during the term of the course. Active participation and attentiveness at all trainings will enhance your experience in the course and will also help you to find your voice. Willingness to be guided in your growth and wellness. Show improvement in your personal asana practice and demonstrate an ability to understand asana dynamics. Be able to lead a basic yoga class. Excludes cost of books and required weekly classes.